NASA’s Earth Observatory is a vital part of the space agency’s mission to advance our understanding of Earth, its climate, and the ways in which it is similar and different from the other Solar Planets. For decades, the EO has been monitoring Earth from space in order to map it’s surface, track it’s weather patterns, measure changes in our environment, and monitor major geological events. For instance, Mount Sinabung – a stratovolcano located on the island of Sumatra in Indonesia – became sporadically active in 2010 after centuries of being dormant. But on February 19th, 2018, it erupted violently, spewing ash at least 5 to 7 kilometers (16,000 to 23,000 feet) into the air over Indonesia. Just a few hours later, Terra and other NASA Earth Observatory satellites captured the eruption from orbit. The images were taken with Terra’s Moderate Resolution Imaging Spectroradiometer (MODIS), which recorded a natural-color image of the eruption at 11:10 am local time (04:10 Universal Time). This was just hours after the eruption began and managed to illustrate what was being reported by sources on the ground. According to multiple reports from the Associated Press, the scene was one of carnage. According to eye-witness accounts, the erupting lava dome obliterated a chunk of the peak as it erupted. This was followed by plumes of hot gas and ash riding down the volcano’s summit and spreading out in a 5-kilometer (3 mile) diameter. Ash falls were widespread, covering entire villages in the area and leading to airline pilots being issued the highest of alerts for the region. In fact, ash falls were recorded as far as away as the town of Lhokseumawe – located some 260 km (160 mi) to the north. To address the threat to public health, the Indonesian government advised people to stay indoors due to poor air quality, and officials were dispatched to Sumatra to hand out face masks. Due to its composition and its particulate nature, volcanic ash is a severe health hazard. On the one hand, it contains sulfur dioxide (SO²), which can irritate the human nose and throat when inhaled. The gas also reacts with water vapor in the atmosphere to produce acid rain, causing damage to vegetation and drinking water. It can also react with other gases in the atmosphere to form aerosol particles that can create thick hazes and even lead to global cooling. These levels were recorded by the Suomi-NPP satellite using its Ozone Mapper Profiler Suite (OMPS). The image below shows what SO² concentrations were like at 1:20 p.m. local time (06:20 Universal Time) on February 19th, several hours after the eruption. The maximum concentrations of SO² reached 140 Dobson Units in the immediate vicinity of the mountain. Klemetti also cited a report that was recently filed by the Darwin Volcanic Ash Advisory Center – part of the Australian Government’s Bureau of Meteorology. According to this report, the ash will drift to the west and fall into the Indian Ocean, rather than continuing to rain down on Sumatra. Other sensors on NASA satellites have also been monitoring Mount Sinabung since its erupted. This includes the Cloud-Aerosol Lidar and Infrared Pathfinder Satellite Observation (CALIPSO), an environmental satellite operated jointly by NASA and France’s Centre National d’Etudes Spatiales (CNES). Data from this satellite indicated that some debris and gas released by the eruption has risen as high as 15 to 18 km (mi) into the atmosphere. Like all the other terrestrial planets, (Mercury, Venus, and Mars) the Earth is made up of many layers. 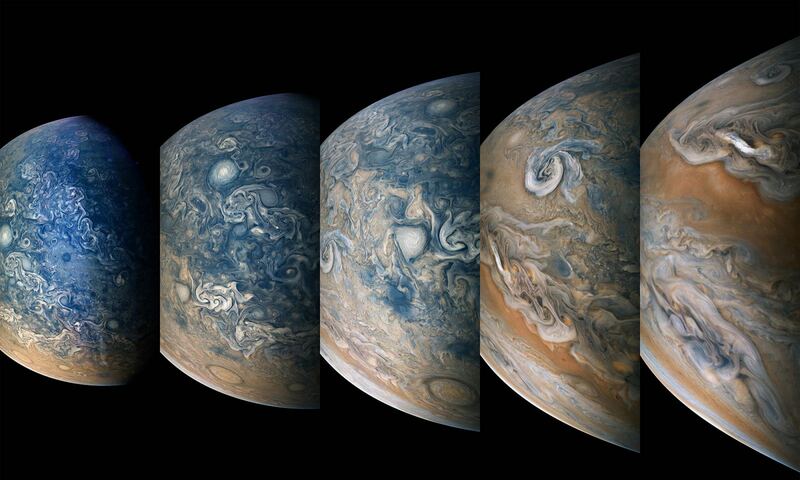 This is the result of it undergoing planetary differentiation, where denser materials sink to the center to form the core while lighter materials form around the outside. Whereas the core is composed primarily of iron and nickel, Earth’s upper layer are composed of silicate rock and minerals. This region is known as the mantle, and accounts for the vast majority of the Earth’s volume. Movement, or convection, in this layer is also responsible for all of Earth’s volcanic and seismic activity. Information about structure and composition of the mantle is either the result of geophysical investigation or from direct analysis of rocks derived from the mantle, or exposed mantle on the ocean floor. [/caption]Mount Krakatoa is a volcanic island found in Indonesia. Its most famous eruption in 1883 is one of the biggest in recorded history. 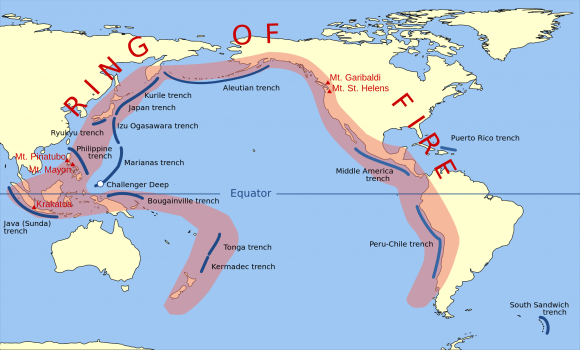 You guessed it right; Krakatoa belongs to the Pacific Ring of Fire, the volatile horseshoe-shaped area bordering the Pacific Ocean. 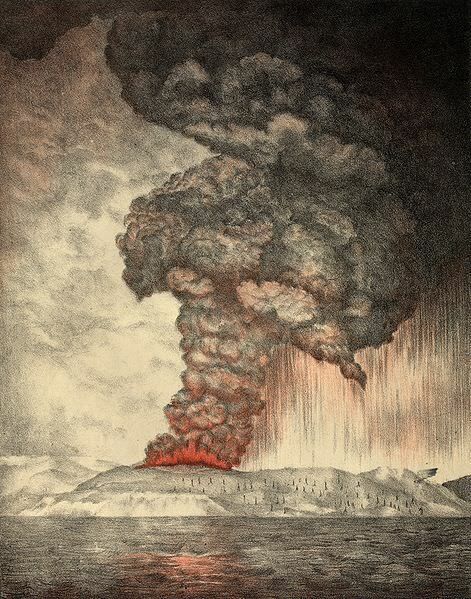 Better known as Krakatau in Indonesia, its eruption in 1883 produced a series of tsunamis that smashed into 165 coastal villages in Java and Sumatra. 36,000 people perished when those giant waves hit. Most of those who were killed during the 1883 eruption, which lasted for two days (Aug 26 to 27), were actually victims of the tsunamis. Some of the giant waves from that eruption, which rose up to 40 meters, managed to reach the southern part of the Arabian Peninsula, some 7,000 km away. When the 2004 Indian Ocean Tsunami (a.k.a. the 2004 Indonesian Tsunami) struck, it reminded the scientific community of the 1883 eruption because of the proximity of their points of origin. The eruption also had a large impact on the global climate. On the average, temperature dropped by as much as 1.2ºC in the succeeding year. In the years that followed, global climates were very erratic, stabilizing only 4 years after. Mount Krakatoa’s lava was known to be made of dacite or rhyolite. This explains the magnitude of its eruption. Generally speaking, volcanic eruptions are more explosive if their lava is composed of dacite or rhyolite. They are cooler and stickier than basalt, allowing them to accumulate pressure before being set free. Although the 1883 eruption destroyed more than 60% of the volcanic island, a submarine eruption in 1927 produced a new island in its stead. This volcano is aptly called Anak Krakatau, which is Indonesian for “Child of Krakatoa”. Anak Krakatau’s radius is estimated to be 2 kilometers and rises up to a maximum height of 300 meters above sea level. Studies have shown in to be growing at a rate of 5 meters per year. Before 1883, three volcanoes known as Rakata, Danan, and Perbuwatan combined to what then became Krakatoa island. Mount Krakatoa is an example of a stratovolcano, a tall, conical volcano with multiple strata of solidified lava, tephra, as well as volcanic ash. These type of volcanoes typically have steep sides and usually erupt frequently & violently. Most of the popular eruptions have been made by stratovolcanoes. Other known stratovolcanoes are Mount St. Helens and Mount Pinatubo. Indonesia is the country that holds the biggest number of active volcanoes, at 130. Iceland, another volcano-dotted country, holds about the same number (of volcanoes) but not all are as active as those in Indonesia.